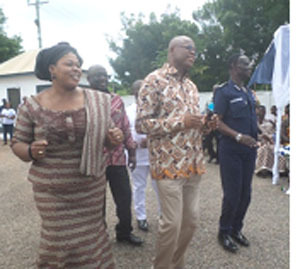 Outgoing B/A Regional Police Commander, DCOP Tachi-Poku (middle) and the MCE for Sunyani, Evelyn Ama -Kumi Richardson, 21C ( in uniform) on the dancing floor. DEPUTY BRONG AHAFO Regional Police Commander, Deputy Commissioner of Police (DCOP) Edward Oduro-Kwateng, has advised police officers in the country to plan their retirement well while in active service in order to prevent them from dying early during retirement as a result of frustration. He gave the advice yesterday at a send-off party held in honour of outgoing Regional Police Commander, DCOP Kwame Tachi-Poku, in Sunyani. According to DCOP Oduro-Kwateng, statistics in the service indicate that most police officers die early after their retirement due to frustration and harsh conditions because they failed to prepare for their retirement. He praised his boss for introducing security measures that have contributed to a reduction in crime in the region particularly in the Sunyani Municipality. He said under his tenure, DCOP Tachi-Poku introduced snap police checkpoints on all roads leading to the central business district. He also introduced foot patrols at residential areas in the municipality especially in the afternoon when workers had left for work. This, he said, had helped to reduce crime and pilfering during the day time when workers had gone out to work. He praised and thanked him for exhibiting a high sense of professionalism and hard work in his career as a police officer. The Regional Minister designate for Brong Ahafo Region, Evans Opoku Bobie, praised the outgoing commander for reducing crime rate in the region. He praised him for being disciplined and time-conscious. He hopes whoever finally takes over from DCOP Tachi-Poku will exhibit the same qualities. Unfortunately, torrential rains in Sunyani disrupted the send-off party, preventing the outgoing commander to make a speech. The rains even spoilt food prepared for the occasion.